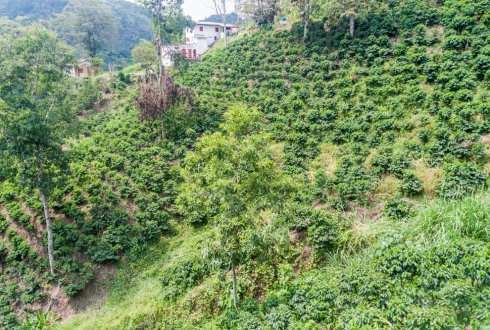 With an investment of 25 million euros the Colombian coffee sector should become climate proof to ensure more than half a million coffee farmers to cope with or fight the impact of lack or excess of water in 25 Colombian river basins. The programme 'Manos al Agua' ('hands on water') generates solutions to avoid annual losses of up to 30% of crops, affecting farmers' income and livelihood. On Friday May 27th the private-public initiative presented their mid-term results in The Hague, Netherlands. The Intelligent Water Management programme 2013-2018, Manos al Agua, shows significant progress to contribute to increase the resilience and adaptability of the coffee sector to water and climatic phenomena. The programme yields the participation of eleven thousand coffee growing families, fifty public, private and civil organizations linked to water management and covers more than 150.000 hectares in the Andes mountains in the first five years. The innovative program for integrated water management in 25 Colombian river basins is led by Colombian Coffee Growers Federation (FNC), the Dutch Ministry of Foreign Affairs, the Presidential Agency for International Cooperation (APC Colombia), the multinational companies Nestlé and Nespresso, Wageningen University & Research Centre and Cenicafé. The next few years the investments should further reduce poverty, foster cooperation for farming improvements, protect the environment, encourage partnerships and influence policy to develop and enhance the Colombian coffee sector. The project develops a climate adaptation model, implementing technologies that reduce production losses from climate hazards (now up to 30%) and that lower the environmental impacts of coffee production on the environment and landscape. In the long term it will benefit more 563.000 coffee-growing families to increase their competitiveness, wellbeing, and resilience and adaptability to water and climatic phenomena. With the coffee-growing families in the river basins of Antioquia, Caldas, Cauca, Nariño and Valle del Cauca, the transfer has to take place of appropriate technologies for adequate water use and pollution management on the coffee farms; at the same time, bioengineering and reforestation techniques are applied to stabilize the river basin ecosystems.